Two Hebrew words that seem to have similar roots, but very different meanings are rahut רהוט - "fluent" and rahit רהיט - "furniture" (as in a piece of furniture, the general term for furniture is rihut ריהוט). Let's look at rahut first. This derives from the Aramaic root רהט, meaning "to run", and it's cognate with the Hebrew equivalent - רוץ. 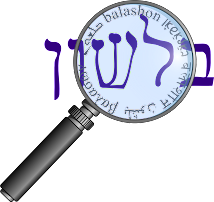 (The letters tzade and tet can switch between Hebrew and Aramaic, as can also be seen in the words tzel צל - "shade" and טלל - "to overshadow", the root of talit טלית). From the meaning "to run", we also get "to flow". This meaning appears in the word rahat רהט meaning "watering trough" in Bereshit 30:38,41 and Shemot 2:16, as well as the word rahut, which is first found in Medieval Hebrew (fluent and flow are related in English as well). "Cedars are the beams of our house, our rafters (rahiteinu) are cypresses"
Rahit as "rafter" appears in Talmudic Hebrew as well, but only in modern times did the meaning change to "furniture." Why? In this article (and here in Hebrew), Elon Gilad writes that the synonym used in the verse, kora קורה - "beam" had become much more popular, and so rahit was in danger of being forgotten. So Eliezer Ben-Yehuda rescued the word for the concept of "furniture", which was no longer an item just for the rich. He was influenced by the Arabic word rihat, which had a similar meaning. Stahl adds that in the Talmud we find the phrase רהיטי ביתו - rihitei beito, which then meant "the rafters of his house", but the early writers of modern Hebrew would find that an appropriate phrase for various articles used in the house. The only question that remains is, are the two terms related? Klein doesn't say so, but there are some sources that hint to a possibility. The Daat Mikra on Bereshit 30:38 points out that the troughs were made of korot (beams), but doesn't actually say that this indicates a connection between rahat and rahit. Steinberg, in Milon HaTanach, does say they derive from the same root, but doesn't explain how. Similarly, in this more recent book a connection is made, but I don't quite understand (other than an Aramaic connection). The best citation I could find that does connect the terms is the BDB, which defines rafters as "strips running between beams." We find that usage in English as well, for a "runner" can also mean something spanning some distance, as in the runners of a sled or a carpet spanning a hallway.